"Delivers a superior clean and has many of the same features as full-size models." "Hundreds of dollars cheaper than many other products." "Has an impressive 2.8 cubic foot capacity and electronic one-touch controls." "Small enough to stash in a closet or cabinet." "Essentially a pared-down version of a full washer." "This compact, manual washer is simple and straightforward." "Quiet, efficient, and affordable—an ideal solution for apartment-dwellers." "You power the machine via a hand crank so it doesn’t rely on electricity." For an affordable portable washing machine that delivers a superior clean and boasts many of the same features as full-size models, you need the Magic Chef Compact Portable Top Load Washer. This appliance looks like a shrunk-down top-load washing machine, and it’s 0.9 cubic foot capacity is perfect for doing small loads of laundry. This portable washer features a see-through top window, electronic controls, and a stainless steel inner tub. To use it, all you have to do is attach the water supply hose to a water faucet. You can then choose from five wash cycles, including normal, heavy, gentle, quick, and soak, and there are three water levels, as well. Reviewers absolutely love the Magic Chef Portable Washer, writing that it’s an ideal solution for small apartments and RVs. Many say it’s easy to set up, operates quietly, and does a great job washing their clothes. If you only need a portable washer for temporary use, you might not want to spend a whole lot of money on it. In this case, you should check out the KUPPET Portable Washing Machine, which is hundreds of dollars cheaper than many other products. This cute purple mini washing machine has two separate tubs: one for washing and one for spinning. To wash clothes, simply load up the washing tub, put in water and detergent, and choose the wash mode and time you’d like. Once the cycle is finished, simply use the drainage tube to get rid of the dirty water. You’ll then have to transfer your clothes to the spin compartment to wring out any excess water. Reviewers say there’s a bit of a learning curve with this affordable washer, but once you get the hang of it, the machine works great and is an unbeatable value. Most portable washing machines are pretty small, which can be frustrating if you have a lot of laundry to wash. If you’re willing to pay more for a larger, more advanced portable washing machine, the GE Portable Washer will make laundry day a whole lot easier. This high-end portable washer has an impressive 2.8 cubic foot capacity—almost three times larger than many comparable products! It has electronic one-touch controls, and you can choose from eight different cycles and four wash temperatures. The machine features caster wheels that let you easily move it around your home, as well as a stainless steel basket that resists rust and won’t harm your clothes. The water input hose easily connects to a standard kitchen or bathroom sink, and reviewers absolutely love that the tub is big enough to wash sheets and towels, as well as larger loads of clothing. Many note that it’s easy to operate and extremely quiet, making it a great alternative to a full-size washing machine. You may not have much storage space in a small apartment or RV, which can make it challenging to find room to store a portable washer. Luckily, there are products like the COSTWAY Mini Washing Machine, which are small enough to stash in a closet or cabinet. This mini washing machine measures just 14” long, 13” wide, and 20” tall. Its compact design makes it an ideal product to bring on long road trips or camping, but it could also work in an apartment or RV. The single tub washes and spins small loads of laundry, and you can choose how long to wash items for via the timer. Once you’re finished washing, simply drain the dirty water out the bottom via the included drain house. According to reviewers, this compact machine packs a big punch, getting clothes clean in a short amount of time. Sure, you can’t fit a lot in the small tub, but it’s a great product if you’re pressed for space, as it can easily be operated on the kitchen counter. Looking for a small, yet powerful portable washer to keep in your RV? One of your best options may be the Black + Decker Portable Washer, which gets top marks from happy reviewers. This appliance is essentially a pared-down version of a full washer. It features a LED digital display panel, transparent top lid, stainless steel tub, five cycles, three water levels, and even automatic unbalance detection. Simply hook the washer up to a sink via the included drain hose and adaptor, then let the appliance get to work cleaning your clothes. Reviewers say this portable washer is surprisingly spacious for such a small machine, and many note that it’s a great investment for RVs or small apartments. The Lavario Portable Clothes Washer is the perfect gadget to take with you on camping trips. This compact, manual washer is simple and straightforward, allowing you to wash a few items of clothes in mere minutes. To use this gadget, simply load up the basket with the clothes you want to wash. Pour water and detergent into the bucket, then submerge the basket and pump it up and down. Within a few minutes, your clothing will be clean, and you can refill the bucket with clean water to rinse. Wring excess water out of your garments, then hang them up to dry—it’s that easy! Reviewers say the manual operation and compact design make this machine a must-have for camping, but many note they like it so much that they use it to wash clothes at home, too. If you’re sick of paying to use your apartment’s coin-op laundry machines or dragging bags of clothes to the laundromat, invest in a product like the Best Choice Portable Twin Tub Washing Machine! The lightweight, space-saving design will allow you to clean your clothes in the comfort of your own apartment. This product features two tubs that allow you to wash and dry your clothing. You can choose to attach the hose to a faucet to add water, or you can do it by hand. The washer runs for up to 15 minutes, then you transfer clothing to the other compartment for a five-minute spin cycle. Reviewers say this machine is ideal for anyone who only has a small amount of laundry, and many love that the washer is quiet and efficient. It’s an ideal solution for apartment-dwellers—and affordable to boot. If you’re living off-the-grid, you’ll probably need a portable washing machine that doesn’t rely on electricity. 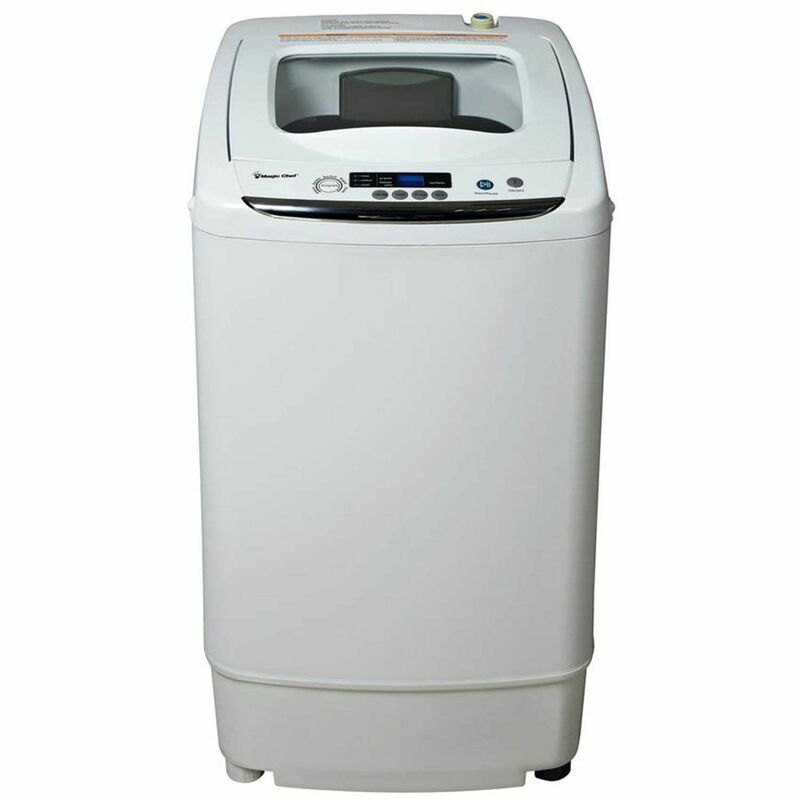 In this case, you should definitely consider the highly-rated Laundry Alternative Wonderwash Portable Washing Machine. This manual washing machine weighs just 6 pounds, and it can clean laundry in a matter of minutes. You power the machine via a hand crank, and the tub can fit up to 10 T-shirts at a time. It’s gentle on clothes, and reviewers say it does an amazing job getting items clean. Because it doesn’t rely on electricity, it’s perfect for those living off-the-grid or anyone who’s trying to cut back on electric bills. Our writers spent 2 hours researching the most popular portable washing machines on the market. Before making their final recommendations, they considered 15 different portable washing machines overall, screened options from 10 different brands and manufacturers and read over 50 user reviews (both positive and negative). All of this research adds up to recommendations you can trust.